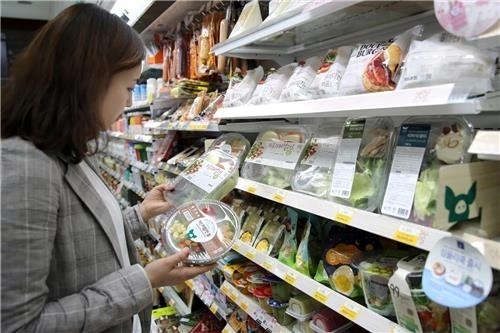 The popularity of salads at convenience stores is rising amid more people opting for quick, affordable and health-conscious food items, according to a report from GS Retail on Friday. GS25, a convenience store chain operated by GS Retail, has seen its sales of salads rise by 278.6 percent between this year through Thursday, compared to the same period last year. Sales of salads have seen a constant rise, with the on-year growth rate touching 209.1 percent in 2015, 144.4 percent in 2016 and 179.7 percent last year. Salad products have been most popular among customers in their 20s and 30s, who accounted for about 66 percent of the sales. Almost 70 percent of sales were made from 10 am-2 p.m. and 6 p.m.-10 p.m. Some 42.6 percent of those purchasing salads were in office areas, followed by 22.7 percent in residential areas and 17.9 percent near subway and bus stations. By gender, 52 percent were men, and 48 percent women.